One of the biggest honors a friend can bestow upon you is to ask you to be a bridesmaid at her wedding. If you are expecting your own bundle of joy when her wedding is planned, you may be tempted to turn down the honor. However, you don't have to worry about finding a maternity bridesmaid dress that will fit, flatter, and be comfortable for the day. 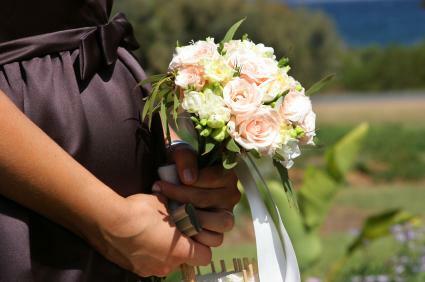 Accept your friend's request and work with her to find yourself the perfect maternity style for the wedding day. Purchasing bridesmaid separates, or two piece styles, rather than full dresses also allows for some wiggle room when it comes to a pregnant bridesmaid. This will allow a pregnant bridesmaid to have a stretchy panel added to the skirt. The panel will stretch with her, eliminating the need for last minute fittings. Alternatively, pregnant bridesmaids can always purchase maternity formal wear that matches the color, style, and fabric of the other bridal party dresses. David's Bridal has a collection of bridesmaid dresses perfect for the mom-to-be in any wedding party. Dresses range from short to long, with various necklines to give brides and bridesmaids a wide range of options. The Dessy Group features several affordable maternity options in a vareity of colors. Browse the Bari Jay Bridesmaids maternity bridesmaid dress collection to see over 30 designs. If you cannot find the perfect maternity dress, you can always order a regular dress one to two sizes larger, depending on the stage of pregnancy. Someone in her first trimester or early second trimester may only need one size bigger, while someone in her late second to third trimester may need two sizes bigger. When in doubt, it is always best to order bigger. It's usually easier to alter a gown down a size than up. When selecting maternity bridesmaid dresses, keep the dress style simple. Large bows, excessive lace at the waistline and ruffles can make belly bumps look larger. If you cannot find a maternity bridesmaid dress that fits in with the wedding party attire, consider having the dress custom made of the same fabric. Do not go in for your final fitting of a maternity bridesmaid dress until a few days before the wedding, especially if you are in the third trimester of pregnancy. Pregnant bridesmaids should also be careful of the shoes they wear for the wedding itself. Stilettos or other high-heeled options may not be the most supportive for someone who will be on her feet for the entire ceremony. Additionally, feet can swell during pregnancy, causing a need for a bigger size. Purchase bridesmaid shoes close to the wedding date to make sure you can walk in them and that they fit comfortably. A woman can be a bridesmaid or bridesmatron even if she is expecting. Brides shouldn't hesitate to ask pregnant friends to be in their bridal party and expectant moms shouldn't worry about what they look like. With the numerous stylish maternity bridesmaid dresses out there, it will be easy to find one that looks great for the big day.